The story was serialised daily in Le Soir, Belgium's leading francophone newspaper, from December 1943 amidst the German occupation of Belgium during World War II. After he was cleared two years later, the story was then serialised weekly in the new Tintin magazine from September 1946 to April 1948. 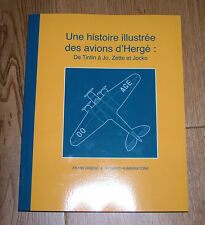 An illustrated history of Hergé's aircraft - from Tintin to Jo, Zette and Jocko - 176pp book in English. Aircraft feature prominently in the graphic works of Hergé. This detailed study in 176 full colour pages details each type and places it in its historical context. L'île noire Edition fac-similé Black & White. The fac-similés albums are identical copies of the first editions of Tintin albums. Series - Fac-similé B&W. We do not mark any orders as "gifts" or with lower prices than those invoiced / paid; these actions are prohibited under national and international law. By 2007, a century after Hergé's birth in 1907, Tintin had been published in more than 70 languages with sales of more than 200 million copies. Collection of the 24 Adventures of Tintin, created and drawn by Hergé. Tintin and the Lake of Sharks (French: Tintin et le lac aux requins) is an animated film based on The Adventures of Tintin, directed by Raymond Leblanc (1972). It was later adapted into a comic book with still images from the film used as illustrations. Pursuing the mystery of these cigars, they travel across Arabia and India, and reveal the secrets of an international drug smuggling enterprise. Series - The Adventures of Tintin. Language - Nederlands. 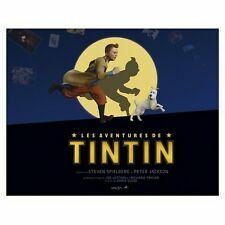 Tintin album small size 17 cm X 22.5 cm rare released in 2006. Nom de publication Les Aventures de Tintin. Séries Tintin. Date de publication mai 2006. Format Relié. Hergé intended the story as a satirical criticism of the expansionist policies of Nazi Germany, in particular the annexation of Austria in March 1938 (the Anschluss). Series - The Adventures of Tintin. The story was serialised weekly in the newly established Tintin magazine from September 1946 to April 1948. Series - The Adventures of Tintin. Presentation - Hardback. We do not mark any orders as "gifts" or with lower prices than those invoiced / paid; these actions are prohibited under national and international law. Tintin au Congo Edition fac-similé Black & White. The fac-similés albums are identical copies of the first editions of Tintin albums. Series - Fac-similé B&W. We do not mark any orders as "gifts" or with lower prices than those invoiced / paid; these actions are prohibited under national and international law. The story was serialised daily in Le Soir, Belgium's leading francophone newspaper, from February to September 1943 amidst the German occupation of Belgium during World War II. Series - The Adventures of Tintin. Preface to Steven Spielberg and Peter Jackson. This richly illustrated book recounts the adventure of the film. 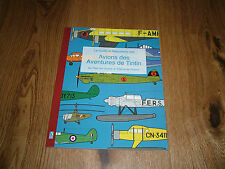 Nom de publication Artbook Les Aventures de Tintin. Séries Tintin. Auteur Collectif Chris Guise / Spielberg / Peter jackson. This album, first published in 1968, is unusual in the Tintin series for its science fiction and paranormal influences. The central mystery is essentially left unresolved. Series - The Adventures of Tintin. The story revolves around Brussels' modern art scene, where the young reporter Tintin discovers that a local art dealer has been murdered. Series - The Adventures of Tintin. Presentation - Hardback. We do not mark any orders as "gifts" or with lower prices than those invoiced / paid; these actions are prohibited under national and international law. Partway through serialisation, Le Soir Jeunesse was cancelled and the story began to be serialised daily in the pages of Le Soir. Series - The Adventures of Tintin. Presentation - Hardback. We do not mark any orders as "gifts" or with lower prices than those invoiced / paid; these actions are prohibited under national and international law. Pursuing the mystery of these cigars, they travel across Arabia and India, and reveal the secrets of an international drug smuggling enterprise. Series - The Adventures of Tintin. Presentation - Hardback. The story was serialised daily in Le Soir, Belgium's leading francophone newspaper, from October 1941 to May 1942 amidst the German occupation of Belgium during World War II. Series - The Adventures of Tintin. 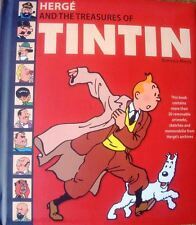 It was serialised weekly from September 1958 to November 1959 in Tintin magazine and published as a book in 1960. Hergé considered it his favourite Tintin adventure and an emotional effort, as he created it while suffering from traumatic nightmares and a personal conflict while deciding to leave his wife of three decades for a younger woman. Les aventures de Tintin. The sunflower case. L'oreille cassée Edition fac-similé Black & White. The fac-similés albums are identical copies of the first editions of Tintin albums. Series - Fac-similé B&W. We do not mark any orders as "gifts" or with lower prices than those invoiced / paid; these actions are prohibited under national and international law. Partway through serialisation, Le Soir Jeunesse was cancelled and the story began to be serialised daily in the pages of Le Soir. Le crabe aux pinces d'or Edition fac-similé Black & White. The fac-similés albums are identical copies of the first editions of Tintin albums. Tintin en Amérique Edition fac-similé Black & White. The fac-similés albums are identical copies of the first editions of Tintin albums. We do not mark any orders as "gifts" or with lower prices than those invoiced / paid; these actions are prohibited under national and international law. Le lotus bleu Edition fac-similé Black & White. The fac-similés albums are identical copies of the first editions of Tintin albums. Series - Fac-similé B&W. We do not mark any orders as "gifts" or with lower prices than those invoiced / paid; these actions are prohibited under national and international law. Presentation - Hardback. We do not mark any orders as "gifts" or with lower prices than those invoiced / paid; these actions are prohibited under national and international law. After completing your order you will see a confirmation screen for your order with our bank details. The story was serialised daily in Le Soir, Belgium's leading francophone newspaper, from June 1942 to January 1943 amidst the German occupation of Belgium during World War II. The story revolves around young reporter Tintin, his dog Snowy, and his friend Captain Haddock, who discover a riddle left by Haddock's ancestor, the 17th century Sir Francis Haddock, which could lead them to the hidden treasure of the pirate Red Rackham. Spanish comic. In used but good condition (see pictures). By 2007, a century after Hergé's birth in 1907, Tintin had been published in more than 70 languages with sales of more than 200 million copies. 9 mini facsimiles of the first 9 Tintin albums in black and white, grouped in an elegant support.